Can’t get to the bull sale to bid on that dream bull? Consider buying a bull online from a reputable breeder. 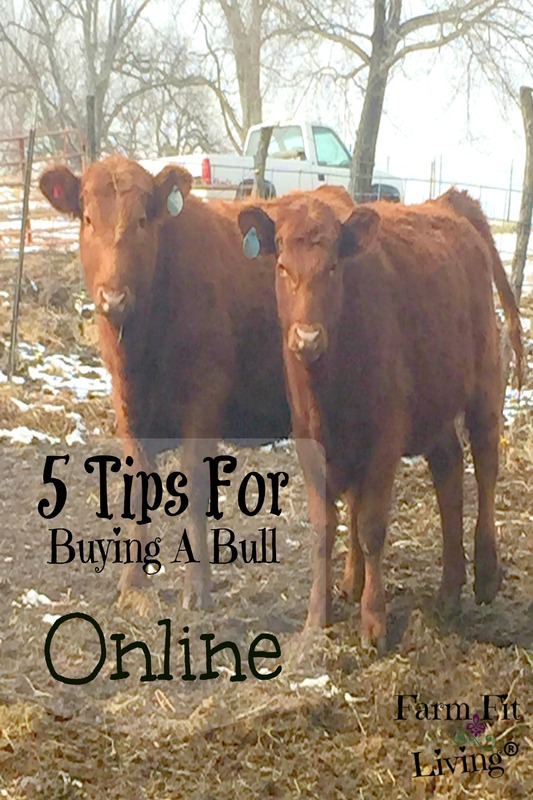 Buying a bull online can be stressful and exciting all at the same time. In the past, all sales of bulls were either one-on-one private treaty or auctions at the breeder’s ranch or local salebarn. With the age of new technology, breeders are open to more and more ways to sell their bulls to a vaster audience. This gives producers more options to buy the best genetics for their operations. Not only is this more options for the buyer, but for the seller as well. More options to buy equals more options for more customers. More options for customers equals more bids at the sale, resulting in higher priced bulls. All-in-all, there’s more of a demand for the bulls when there are more customers involved in the bidding wars. Since travel can be expensive, the online option is nice for out-of-state or country breeders to have the chance to bid on the animal they want from the comfort of their homes or offices. The main thing an online buyer needs to do to compete in the auction bidding war is to make an account with the auction company and apply for a bidder number. I suggest doing this ahead of time because the auction company will call you to confirm address and payment before the bidding number can be accepted. I was definitely thankful for the online option to buy a bull for my heifers. If it weren’t for the option of buying a bull online, I would not have made it to the sale. At 39 weeks pregnant, a three hour drive to a sale was a bit too far away from my home hospital. Going into labor at a bull sale wasn’t really at the top of my list of things to do for the day. Since I knew I would either be this far along in my pregnancy or home with a new baby, I decided way in advance that I would choose the online bidding option in advance. Thankfully, I did have a plan for buying a bull online. It was simple. Start researching early and make a list of bulls I wanted to bid on. I chose this sale because the breeders are in the state in which I live. They also have a great reputation for breeding sound structured bulls that have very low birth weights and high calving ease. These traits were important to me since I was needing a bull to breed to my heifers. Luckily, the breeder had great videos and Expected Progeny Differences (EPDs) available for all the bulls in the sale up online weeks in advance of sale day. Since every breed’s EPD’s are a little different, I had to study the Red Angus EPD numbers and what they meant. This allowed me to do my research for buying a bull online, make my list and have a plan to compete in the bidding wars on sale day. The research was simple, but very intense. There were 190 bulls in the sale and I viewed and studied every single one. Most bulls were easy to eliminate from my list because they just did not meet my requirements for a low birth weight and high calving ease bull. First, I looked at the Actual Birthweight number of the bulls listed in the top corner of the EPD Box. I wanted bulls who had weighed 50-60 pounds. All bulls who had weighed 70 pounds and above were eliminated. I was able to make a list from those numbers of 30 bulls. Since I only needed one bull, that list was still too long and needed to be narrowed down more. Second, I looked at the birth weight (BW) EPD and the calving ease (CED) EPD for each bull on my list. The BW number should be negative and the CED should be a higher number indicating a low birth weight and high calving ease estimate. The Red Angus EPDs also indicate what percent the number is for the entire breed. So, I was looking for bulls in the top 10% or higher for those certain EPD’s. Only the best for my heifers. As I continued to narrow down my lists of bulls, I looked at other EPD’s. 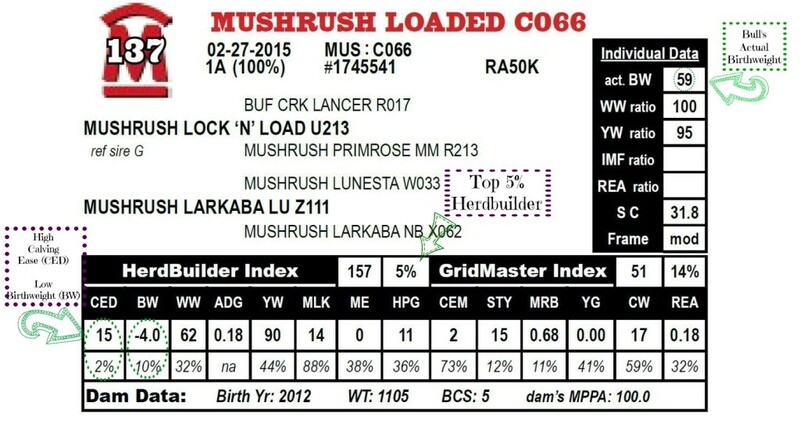 I also looked at the Herdbuilder Index number, which indicates that the bull has a high probability of producing high quality heifers to stay in the herd. Finally, after researching and eliminating, my list was strong at 10 bulls. Any of these bulls would be perfect for my heifers. I was ready for buying a bull online. Or, at least I thought I was. When you want the best for your herd, you find that others also want what you want. The availability of the online option to bid was bringing in breeders from all across the country who wanted a bull just as badly as me or anyone else. I was prepared for all the bulls to be priced high, but I was unprepared at first for the actual bidding war. Luckily, I was able watch several lots sell before the first bull on my list came in. When he did come in, I was overwhelmed at the prices the bulls were bringing. The first bull I bid on was way over my head. There was a strong demand for these bulls, I could tell, but there were still many lots of bulls to go. I had to continue to be patient and wait for the prices to level out. I had to be strong and stay within my price range. As the sale continued on, I continued to get nervous. I bid on the bulls that were on my list but continued to be outbid time and time again. The urge to go out of my price range was feeling higher. But, I knew I had to remain in control for the sake of my budget. I was very frustrated by this point and worried that I would not get a bull bought from this sale. But then, I felt a stroke of confidence. Finally, the third to last bull on my list came into the ring. I put my negative feelings aside and put my game face on. The bidding war began. I didn’t even think about it. The bull wasn’t going too high, but soon I reached my threshold. Luckily, I had the winning bid for a few second and then…Boom. I got outbid once again. I decided to take the leap and bid one more time. Although I did go over my budget by just a hair, I felt I did well with my first online bull buying experience. Plus, I learned a few things I can carry with me to the next round. It’s important to have a plan before you start the sale. Bidding is going to come quick and hard. Feeling a sense of preparation will help you to be patient and have self control throughout the chaos of the bidding wars. Among the chaos and feeling of frustration, understand that everything you strive for will fall into place. Whether it’s meant to be or not, you need to have faith in yourself. Believe in yourself, focus on what matters and wait for top bid to be rewarded to you.